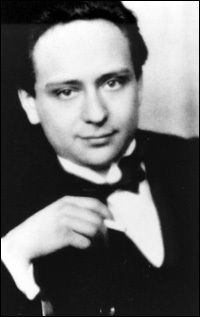 Viktor Ullmann (1898–1944) was born on 1 January 1898 in the garrison town of Teschen in Silesia, in what belonged to the Austro–Hungarian Empire and is now a part of the Czech Republic. Educated in Vienna, Ullmann made important contributions to both Czech and German cultural life as a composer, conductor, pianist and music critic. Shaped by his engagement with Schoenberg's musical philosophy, German aesthetics, as well the anthroposophy of Rudolf Steiner, Ullmann understood the role of art as central to human spiritual and ethical development. Prior to his death in 1944, he wrote that [artistic] form must be understood from the perspective of Goethe and Schiller as that which overcomes matter or substance [and where] the secret of every work of art is the annihilation of matter through form—something that can possibly be seen as the overall mission of the human being, not only the aesthetic but ethical human being as well. Within the context of his own compositions, Ullmann used form as a powerful commentary on his own self–conscious engagement with the traditions of Western art music as he engaged with them in the works of Schoenberg, Mahler and Berg. The son of Maximilian and Malwine Ullmann, Viktor Ullmann's birth was registered with the Catholic community in Teschen, where he was later baptized on 27 January. Prior to Ullmann's birth, his father, who was of Jewish heritage, had officially renounced his faith and converted to Catholicism in order to advance his military career as an officer in the Austrian army. In order to avoid the itinerate lifestyle that her husband's work imposed on the family, when he was dispatched for extended periods to military outposts throughout Silesia, Ullmann's mother moved with him to Vienna in 1909, where he attended gymnasium until 1916. Concurrent to his schoolwork, Ullmann studied piano under Eduard Steuermann and received theory and composition lessons from Arnold Schoenberg's student Josef Polnauer, beginning in 1914. Although there is little documentation concerning Ullmann's early musical engagements beyond these lessons, a program from his gymnasium years indicates that Ullmann conducted his school orchestra in 1915 in a concert of works by Mozart, Schubert, and Strauss. After completing his Kriegsabitur, facilitating his early graduation from the gymnasium in May 1916, Ullmann enlisted for voluntary military service and was sent to the Isonzo–Front, after initially serving in a garrison in Vienna. Decorated for bravery for his service in the war, Ullmann was made a lieutenant in 1918. Returning to Vienna that year after two years of military duty, Ullmann not only entered Vienna University as a law student but was also accepted into Arnold Schoenberg's Composition Seminar, where his classmates included, among others, Hanns Eisler and Josef Travinek. Resuming piano lessons with his former teacher Steuermann at that time, Ullmann, at Schoenberg's recommendation, was made a founding member of the committee for the Verein für Musikalische Privataufführungen. In May 1919, after having worked with Schoenberg for less than a year, Ullmann married his fellow composition student Martha Koref, left the university and abruptly moved to Prague, where musical culture in this cosmopolitan European capital was centered around the Czech National and New German Theaters. Joining the staff at the New German Theater as a choir director and repetiteur in 1920, Ullmann underwent a rigorous training from its director Alexander Zemlinsky, who demanded that he develop a comprehensive grasp of both Czech and German musical repertories. In his capacity as choir director, Ullmann was responsible for preparing the choruses and soloists for different productions, which included, most notably, performances of Schoenberg's Gurrelieder and Mozart's Bastien und Bastienne in 1921. Appointed as a conductor at the theater in 1922, Ullmann maintained this position until 1927. During these formative years in Prague, Ullmann witnessed numerous performances of new works, including the Prague premiere of Berg's Wozzeck at the Czech National Theater in 1926, which became the basis of his life–long admiration of the composer's work. Parallel to his activity at the New German Theater, Ullmann was composing new works such as the Sieben Lieder with piano (1923), the Octet (1924), his incidental music for Klabund's Kreidekreis (1925), the Symphonische Phantasie (1925), as well as the first version of his Variationen und Doppelfuge über ein Klavierstück von Arnold Schönberg (1925), based on the composer's Op. 19, No. 4. An orchestrated version of this work later was awarded the prestigious Emil–Hertzka–Gedächtnispreis in 1934. Although composed in 1923, Ullmann's First String Quartet, Op. 2, was premiered in 1927 on a program advertised as an Evening of Prague Composers, which included works by the composers Hans Krása, Karl Boleslav Jirák, and Fidelio Finke. Ullmann was appointed as the conductor of the opera house in Aussig (now Ústí nad Labem) for the 1927 season, where he conducted, most notably, Tristan und Isolde, Ariadne auf Naxos, Le nozze di Figaro, and Jonny Spielt Auf. Returning to Prague at the end of that season, Ullmann remained without a permanent post, actively pursuing his career as freelance composer at that time. While his Concerto for Orchestra generated interest when performed in Prague in 1929 and in Frankfurt in 1930, it was the second version of his Schoenberg–Variationen, performed by pianist Franz Langer at the 1929 festival of the ISCM in Geneva, which brought Ullmann's work to international attention. Although the period between 1929 and 1931 can be seen as a highpoint of Ullmann's career, when he was engaged by the Zürich Schauspielhaus as a composer of incidental music and his works were being performed throughout Europe, it was also a time of spiritual and intellectual crisis. As part of facing his inner conflicts, Ullmann not only underwent psychoanalysis in Zürich but also continued his exploration of diverse esoteric paths of knowledge, including the I–Ching, the Freemasons, as well as the anthroposophy of the Austrian philosopher and scientist Rudolf Steiner (1865–1925). The term anthroposophy, meaning the wisdom of the human being, was chosen by Steiner to designate a path or epistemology for attaining occult knowledge that he developed through his engagement with Goetheanism, German idealist philosophy, esoteric Christianity, Rosicrucianism, as well the theosophical tradition. As a prominent intellectual figure in the cultural life of pre– and post–World War I Europe, Steiner lectured widely and developed a large following that included intellectuals, artists, scientists and politicians who drew on his ideas as a basis for their own work. Although Ullmann encountered Steiner's work through friends in 1919 while a student in Vienna, he initially rejected it. Ten years later at the time of his crisis in 1929, a visit to the Goetheanum—the international center of the anthroposophical movement in Dornach, Switzerland—became the basis for a radical reorientation of his worldview. Compelled by his new experiences, he eventually joined the Anthroposophical Society in 1931 and subsequently abandoned his musical career for a period of two years in order to manage, and later acquire, an anthroposophical bookstore in Stuttgart. Following the rise of the National Socialists to power in Germany in 1933, Ullmann returned to Prague. As musicologist Ingo Schultz' research has demonstrated, Ullmann's sudden departure was not prompted by the fact that his Jewish identity had been exposed. Rather, it was due to the fact that a legal process had been initiated against him, because of debts he had accrued in conjunction with his eventual purchase of the Novalis bookstore. Arriving in Prague in July of that year and unable to secure a permanent position, Ullmann once again established himself as a freelance musician, making important contributions to both Czech and German musical culture there as a composer, conductor, music journalist and educator. As part of his professional activities, Ullmann lectured regularly at Leo Kestenberg's Internationale Gesellschaft für Musikerziehung and additionally wrote articles and music reviews for journals such as Der Auftakt, Das Montagsblatt, as well as for Anbruch: Monatschrift für Moderne Musik. Once in Prague, Ullmann began work on his monumental opera Der Sturz des Antichrist Op. 9, which he based on a drama of the same name by the anthroposophical writer Albert Steffen. (As a complex archetype of evil in the opera, the Antichrist brings unity to a world ravaged by perpetual war through the formation of a one–world state, which is imposed as the price of individual freedom.) In the opera, which essentially stages a battle between good and evil, the Artist–Poet— unlike the Priest and the Technician— is the only character able to harness the forces necessary to challenge the hegemony of the Antichrist. Completed in 1935, the opera was awarded the prestigious Emil–Herztka–Gedächtnispreis in 1936 by a jury that included Alexander Zemlinsky, Ernst Krenek, Egon Wellesz, Karl Rankl and Lothar Wallerstein, all of whom where leading figures in Prague's cosmopolitan cultural life. Despite the initial success of the work, however, it was never performed during Ullmann's lifetime. With the political movement to the right in Czechoslovakia and Austria after 1933, the work's anti–totalitarian theme made it problematic for institutions like the Vienna Opera and Czech National Theater that later considered it for their repertories in 1935 and 1937. Having completed Der Sturz des Antichrist, Ullmann began a two–year composition course with Alois Hába in his quarter–tone techniques (1935–1937), producing his Sonata für Viertelton–Klarinette und Viertelton–Klavier, Op. 16 in 1936. Other significant works composed and performed in Prague during this period were his Piano Sonata No. 1, the Sechs Lieder for soprano and piano, Op. 17, with texts by Albert Steffen, as well as his String Quartet No. 2, which was performed at the ISCM festival in London in 1938. Works composed after 1938, including his Slawische Rhapsodie, the Piano Concerto, as well as his opera Der zerbrochene Krug, did not receive public performances due to the political situation at that time. With the establishment of the Protectorate of Bohemia and Moravia in 1938, which effectively brought Czechoslovakia under German control, the political situation became increasingly dire as the Nuremburg Laws, which had been applied inside the German Reich, were then applied to the regions in Czechoslovakia under jurisdiction of the protectorate. As a result, the authorities of the occupation introduced anti–Jewish legislation through the puppet government of the protectorate, which, among many other measures, eventually expelled Jews from public life and institutions. After the invasion and subsequent defeat of Poland on 1 September 1939, the administration made plans for massive transports of the Jewish population to take place out of the occupied territories. In this climate of escalating political tension and fear, Ullmann no longer attempted to have his Der Sturz des Antichrist staged. Rather, he directed his efforts towards procuring emigration visas for his family, which now included his second wife Annie Winternitz, whom he had married in 1931, their sons Max and Johannes, as well as their daughter Felicia. In a series of letters written to friends and colleagues in places as far away as South Africa, Ullmann appealed for help. By the end of 1939, having exhausted all possibilities for immigration, Ullmann and his wife made the decision to send their two oldest children Felicia and Johannes in a children's transport to England through the British Committee for Children in Prague. Although Ullmann continued to compose during this difficult period, even self–publishing several new works during the first two years of the war, his personal circumstances grew increasingly serious. With the finalization of his divorce from his second wife Annie in August of 1941, Ullmann, who was already stateless, became single, making him particularly vulnerable to the threat of deportation. By mid–October of 1941, it was known that the administration of the protectorate was making lists for five transports of approximately one–thousand stateless and single Jews from Prague to be deported to the Lodz Ghetto. In a desperate and last minute effort to prevent his anticipated deportation, Ullmann married his new partner Elisabeth Frank–Meissl on 15 October 1941. Although Ullmann did receive a deportation notice for Lodz, the Office of Jewish Community Affairs in Prague intervened on his behalf, providing him with a requisite identification card that effectively rescued him from the transport. This protection was temporary, however, and the following year, on 8 September 1942, Ullmann and his new wife Elisabeth were deported to Terezín, or Theresienstadt as it was renamed by the Nazis, a concentration and transit camp located north of Prague. At Theresienstadt, under the auspices of the Freizeitgestaltung (the Administration of Leisure Activities), a cultural organ of the Jewish self–administration in the camp and officially sanctioned by the SS, Ullmann composed twenty–three works. These included three piano sonatas, a string quartet, arrangements of Jewish songs for chorus, incidental music for dramatic productions, his one–act opera Der Kaiser von Atlantis, as well as his final work, a melodrama based on Rilke's Die Weise von Liebe und Tod des Cornets Christoph Rilke, which he completed in 1944. Parallel to his activity as a composer in Theresienstadt, Ullmann was also influential there as a pianist, conductor, music critic and lecturer and additionally served as the director of the Studio für neue Musik. In that capacity, Ullmann championed the work of his fellow composers in the camp, including that of Pavel Haas, Hans Krasa, Gideon Klein, and Siegmund Schul, in particular. Ullmann's twenty–six surviving reviews of musical events in Theresienstadt, which were a product of his ongoing activity as the official music critic in the camp, provide an important perspective on the astounding cultural life that developed there. Having begun underground, this cultural activity was later allowed to flourish openly, because it provided the Nazis with a propaganda vehicle to deceive the outside world about the conditions in Theresienstadt, which was portrayed to the Red Cross as a model camp during their decisive visit in June of 1944. Behind the façade created by the regime, however, the prisoners where subjected to the same hardships and brutalities as existed in the larger concentration camps, including disease, starvation, torture, executions and the frequent transports to the extermination camps in the east. Death serves as both the historical and dramatic backdrop of Ullmann's 1943 opera Der Kaiser von Atlantis, which he composed while a prisoner in Theresienstadt. Based on a libretto by the young Czech poet and painter Petr Kien, who was also active in the cultural life in the camp. Der Kaiser von Atlantis is a profound meditation on death that stages a dramatic confrontation between the Emperor of Atlantis and the character of Death. The central problem of the opera develops when the Emperor of Atlantis declares a holy war against evil elements in his empire and seeks to conscript Death to his cause. Insulted by the Emperor's effort to involve him in his modernized military campaign, Death—who is already offended by the mechanization of modern life and dying—refuses to cooperate. Instead, he decides to teach the Emperor and humanity a lesson that will demonstrate his centrality in regulating existence by making it impossible for anyone to die. Although Der Kaiser von Atlantis was composed and rehearsed under the auspices of the Administration of Leisure Activities in Theresienstadt, it was never performed in the camp. The parallel between the despotic character of the Emperor Overall and Hitler appears to have been obvious to the SS, who cancelled the production after observing a rehearsal in the autumn of 1944. As a critique of modern warfare and the political tyrannies that perpetuate war, Ullmann's Der Kaiser von Atlantis—like Der Sturz des Antichrist—can be understood as powerful allegory on the despotic nature of power, where the dramatic confrontation with tyranny and death is portrayed as a powerful catalyst in shaping the exigencies of human freedom. In a 1938 letter to his friend Karel Reiner, Ullmann reflected on the development of his musical language, making it clear that his earlier compositions, particularly his Variationen und Doppelfuge über ein Thema von Arnold Schönberg für Klavier, Op. 3a, had been shaped in terms of their harmonic and architectural conception by his engagement with Schoenberg's teachings. Although Ullmann's musical development falls into roughly three periods, with the first extending from 1920 to the early 1930's, he had already begun to distance himself from the Schoenberg school by 1924 as he came increasingly under the influence of Berg's work at that time. During the late summer of 1944, as news filtered into Theresienstadt that the allies had invaded Europe and the Russian front was drawing near, the prisoners waited eagerly to be liberated. From September to October, however, massive transports from Theresienstadt to the Auschwitz and other death camps in the east effectively liquidated the camp. Ullmann was sent to Auschwitz on 16 October 1944 where he perished two days later along with other key figures from the cultural life in the camp.